Libyan military aircraft crashed on Saturday in the country's northeastern city of Benghazi, Libyan National Army spokesman Ahmed Mismari told Sputnik. CAIRO (Sputnik) — According to the spokesman, the pilot of the MiG-21 fighter jet managed to eject from the plane. Mismari suggested that the aircraft could be shot down by enemy forces. The Libyan National Army led by Gen. Khalifa Haftar is currently fighting against terrorist groups in Benghazi. The groups attacked and gained control of Sidr and Ras Lanuf oil fields, pushing out Haftar's forces, earlier in March. 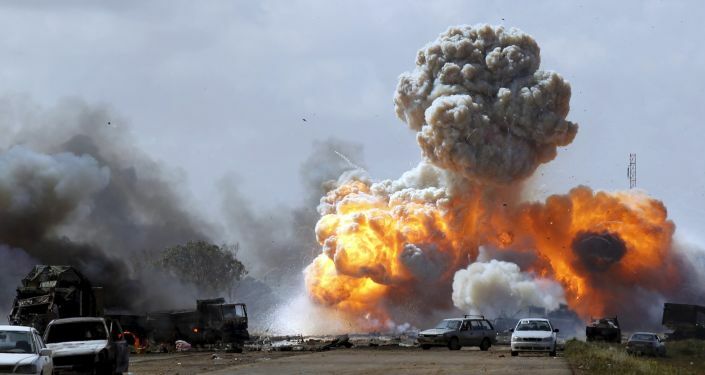 On Tuesday, reports emerged that Libyan government troops drove the militants from the area. Libya has been in a state of turmoil since 2011, when a civil war began in the country and its longtime leader Muammar Gaddafi was overthrown and killed. In December 2015, Libya’s rival governments — the Council of Deputies based in Tobruk and the Tripoli-based General National Congress — agreed to create the Government of National Accord (GNA), to form the Presidency Council and to end the political impasse.